As I work at home alone, I usually prepare a huge seasonal salad for lunch. And when I say seasonal, It means with everything I find in my fridge. That´s why I love salads. You can pair everything with everything and the result is always healthy and tasteful. 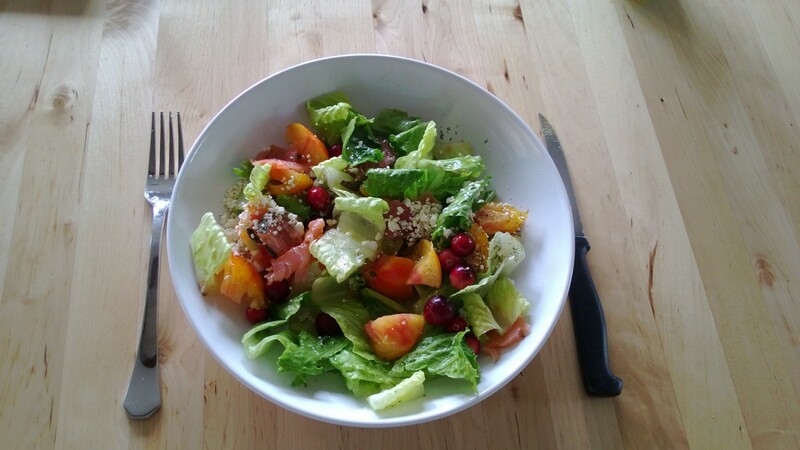 This week I wanted to try with fresh cranberries, which are in season now and full of antioxidants and healthy properties, so I thought maybe their particular bitter taste could fit with romaine lettuce, smoked salmon, and the last tomatoes of the season. I added balsamic vinegar, extra virgin olive oil, dill and my eternal feta cheese ( I need to finish my Costco familiar package). And voilà! A refreshing salad to say hello to fall season and to keep you strong against the change of the weather. Cranberries are one of the three original native fruits from North America. According to The Cranberry Institute, their super antioxidant properties are great to avoid urinary tract infections and protect against heart conditions and certain types of cancer related to the digestive organs. Crop season begins in September and ends in October, but you can find fresh cranberries until December. Besides, their crispy and bitter flavour adds an interesting notch to any dish. Try them! Posted on October 10, 2013, in Products, Recipes, Salads. Bookmark the permalink. Leave a comment.